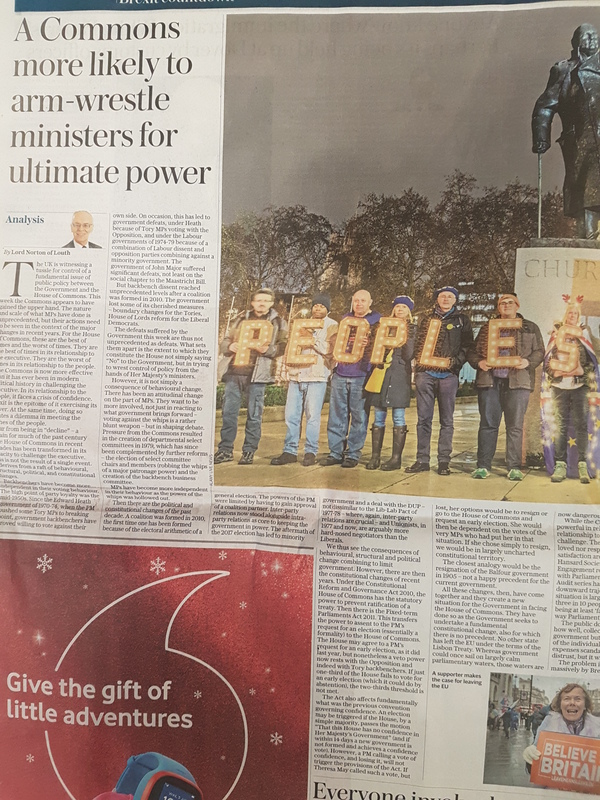 Today’s Daily Telegraph carried a lengthy article by me on the role of the Commons in the light of the Government defeats in the House this week in relation to Brexit. My argument, the core of which will be familiar to some readers, is that for the House of Commons, these are the best of times and the worst of times. It was a theme I developed in my 2016 Michael Ryle Memorial Lecture. They are the best of times for the House in relation to government and the worst of times in relation to the public. A combination of behavioural, attitudinal, structural, political and constitutional changes have rendered the House more powerful than at any other time in modern political history in challenging government. This week’s defeats were not unprecedented as defeats, but they were remarkable in that they constituted an attempt by the Commons not simply to say no to government, but to wrest control over a major issue of public policy. The public, however, do not judge the House on what it does in fulfilling its core functions, but rather on the behaviour of members. The result is that the House is neither loved nor respected. The Brexit debate exacerbates the problem by creating a situation in which MPs by their votes, whichever way they go, are going to annoy a good part of the population. People have taken entrenched positions on different sides and are not going to be budged from their perch of moral certainty and belief that most people agree with their stance (‘the people did/didn’t vote for…’). As a result, MPs cannot and will not please everybody and may well annoy more people than they please. Disapproval of what members do reinforces negative perceptions, however ill-founded, and – as I have argued before – there is no single figure of authority to respond immediately to defend the institution. Parliament comprises two Houses. Each is the sum of its members. There is no one authorized to respond to attacks on the institution. When there is a response, it is usually too late to undo the damage. Members could do more collectively to defend the institution, but they are distracted by other concerns. This entry was posted in Uncategorized and tagged Brexit, Daily Telegraph, government defeats, House of Commons, Michael Ryle Memorial Lecture. Bookmark the permalink. Nope. That was always going to happen with a small majority and a house that didn’t and still doesn’t want brexit. What is it that commits human beings to dysfunctional organisations in the full knowledge of possible destruction to the support they thrived on since their birth.